Stand erect with your chest out and shoulders back, maintaining the natural arch in your back. Your knees should be unlocked, feet hip-width apart. Press a pair of light-weight plates in place against each other isometrically in front of you with a palms-in/fingers forward grip about shoulder height. 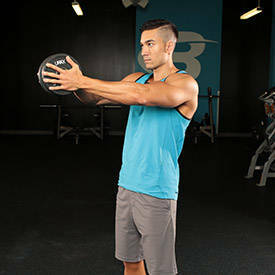 Extend your arms directly out in front of you in the same horizontal plane, then bring the plates back into your chest. Repeat for the required number of reps.